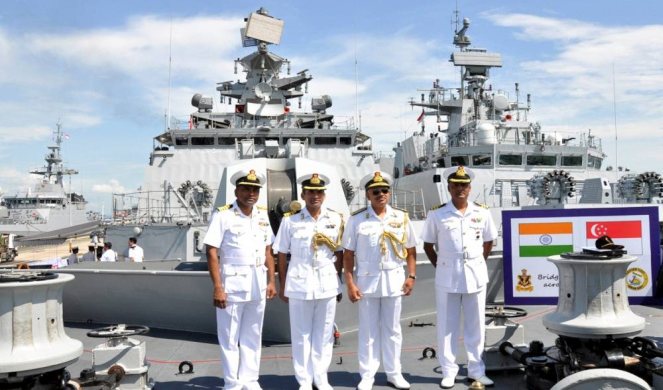 SIMBEX-15 a bilateral naval exercise between India and Singapore commenced on 23 May 2015 in Singapore. It is 3 days exercise which will conclude on May 26, 2015. This edition of naval exercise will give traditional emphasis on anti-submarine warfare (ASW) and more complex maritime exercises. It will involve various facets of naval operations such as air and surface practice firing, air defence, maritime security and search & rescue operations. For this edition of exercise, Indian navy is represented by INS Satpura- an indigenously built guided missile stealth frigate with integral helicopter. INS Kamorta- an indigenous anti-submarine warfare (ASW) corvette. P 8I aircraft- It is a long Range Maritime Reconnaissance Anti- Submarine (LRMRASW) aircraft. From the Singaporean side, Republic of Singapore Navy (RSN) ship Supreme and submarine Archer along with MPA and fighter aircraft are participating. Background Operational interaction between the Indian Navy and Singapore Navy has grown steadily since 1994 after the commencement of ASW training exercises. In 1999, this operational interaction was formalised as an annual bilateral exercise and was christened SIMBEX.